All freelance designers should invest more time for marketing the business as they do other aspects of their operations. Freelancers need as many marketing skills as they can acquire. They also need limitless tools. One of the best marketing tools for designers is the design brief template. It might not look or sound like one, but it’s as effective as any other tool you may ever use for marketing your freelance design business. Below are a few ideas that show why this design brief is perfect for marketing. Marketing is all about proper and effective communication. It offers design consultants an opportunity to pass the right message over to clients. The message seeks to convince clients to order any design or other related services they need from the designer in question. The design brief helps you to improve this aspect of marketing and running your consultancy. However, try to be authentic and offer value to your clients through the design brief template. Designers are mostly interested in designing stuff for their clients. Many of them show no passion whatsoever towards writing. Many of them would rather delegate the writing to expert writers. However, the design brief template encourages consultant designers to be as focused on writing as they are on designing. Use the template to learn to write excellent marketing copies for promoting your brand and increasing awareness among your customer base. Modern freelance design businesses have embraced disruption. Welcome disruptive innovation with open arms. Disruption is the future of all businesses and industries – including freelance design. Let your love for disruptive technology that usher in permanent changes shines through in the design brief. Let it all out so that your clients can see that you’re not afraid of changes or taking the sort of risks that could bring more benefits to everyone. A disruptive consultant is never afraid of appearing controversial. Disruption is not synonymous to recklessness. Good marketers are some of the most confident individuals you will ever meet. The best marketers believe in the product or service they sell. Their confidence rises to the fore every time you hear them speak or read anything from them. You should take a similar approach while marketing your freelance design business. 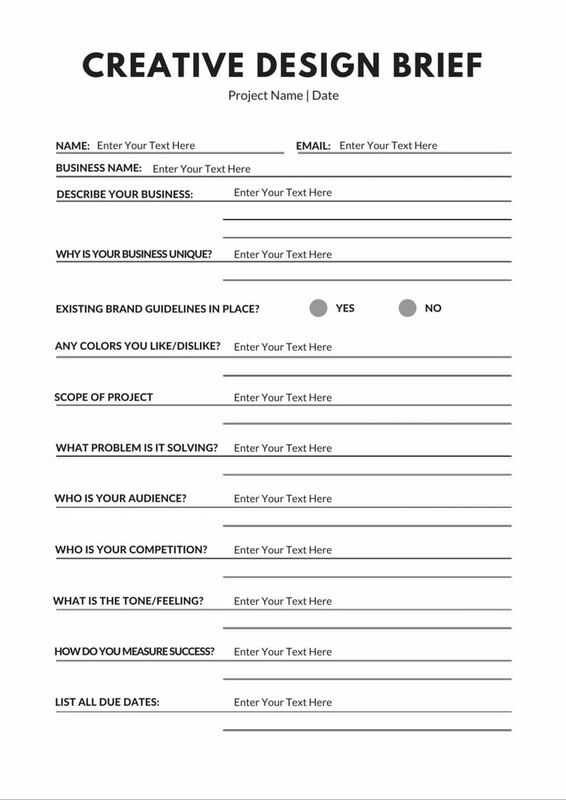 The design brief template offers you a chance to do just that. Use it well to let everybody know that you know what you’re talking about! Can you pull a publicity stunt using the design brief template? Well, the truth is you can do just about anything you want with this one-page document. Here, you get the chance to put your creativity to the test. The template offers you a chance of being as creative as a way of marketing your business. Some of the best marketing gimmicks are short but quite impactful. Use this document to pass the shortest yet most memorable marketing stunt. Nothing works better for your freelance design operations than being a person of your word. It’s good to develop the habit of delivering what you promised your clients. The design brief template offers you a platform for making promises. Do not leave it at that. Instead, do whatever you can to ensure that clients leave impressed at the fact that you are ready to walk the walk too. They will be more inclined to return to you for future design projects. The brief should answer the ‘who,’ ‘what,’ ‘how,’ ‘where,’ and ‘why’ questions properly. 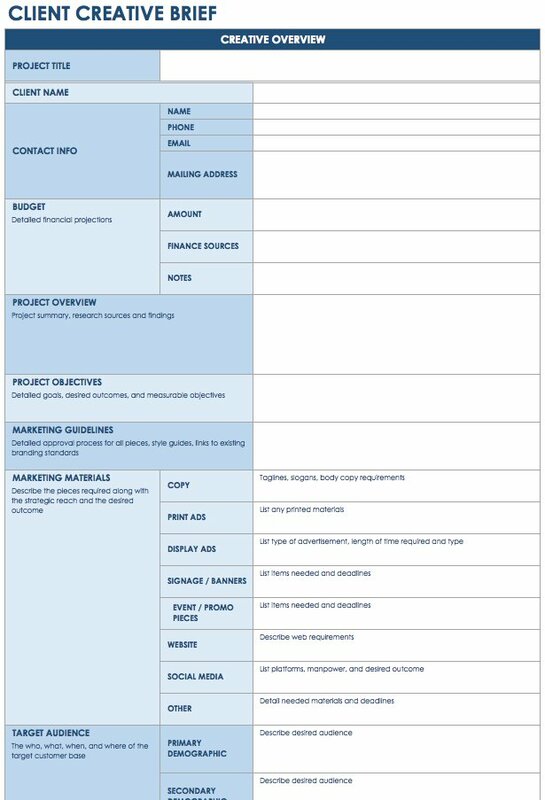 Start using the design brief template as an effective tool for marketing your freelance business.